It is a week since I did this walk. I have taken my time writing this report because it has given me time to relive the experience, to look again and again at the photographs and realise how lucky I was. Opportunities have been rare this winter to risk the long drive from Yorkshire in the hope of good, settled weather. However both MWIS and the Met Office were promising both likely clear tops and low winds as a high pressure ridge edged over the north-west. It was time to take a chance! I arrived at the entrance to the old road to Tomdoun by the Cluanie Inn at 10.30pm and readied myself for the night. Contrary to the forecast, rained drummed lightly on the car most of the night. I set my alarm for 4.40am but was awake well before then. I roused myself when the alarm went off and began to get ready. It was still dark but I could still tell that the sky was blanketed with cloud. At least it was calm, and the rain had stopped. In anticipation of a long day and, hopefully, good weather I downed almost 1ltr of water with my breakfast and was off by 5.40am. Walking up the road I set a gentle pace in order to get used to the slightly heavier than usual pack and the winter boots. 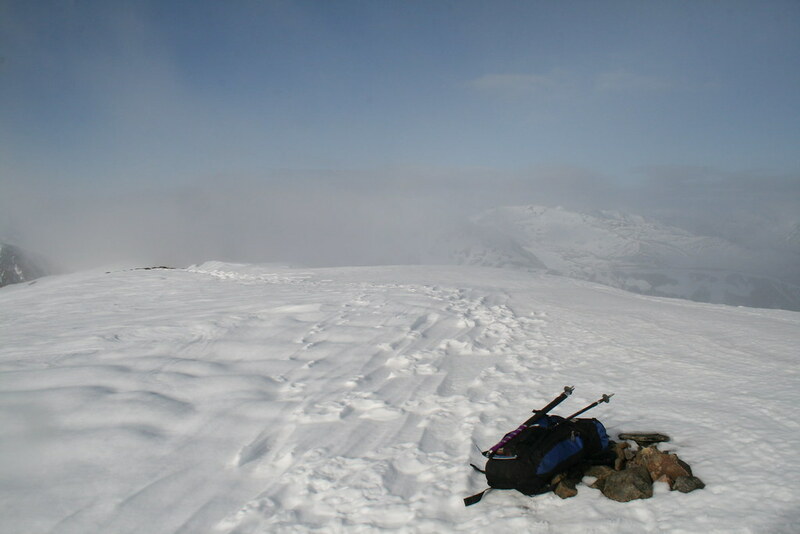 I was carrying ice axe and crampons just in case, though in the event I never needed to use them. The old road is easy angled. After a kilometre and a half the road splits at the entrance to the drive down to Cluanie Lodge which is set amongst some trees at the edge of the loch. 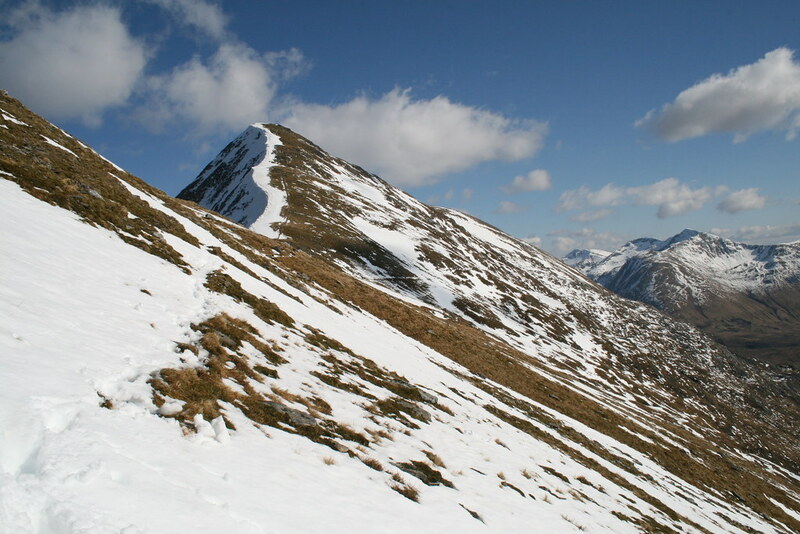 Continuing on the right fork the road then swings to the south and the first Munro of the ridge comes into view. 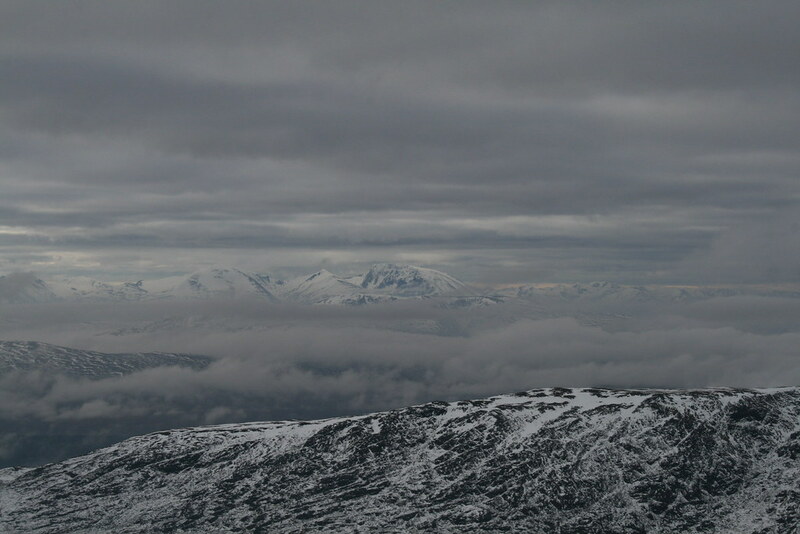 By now some of the low cloud was beginning to break. Views were opening up along the Loch to the west. 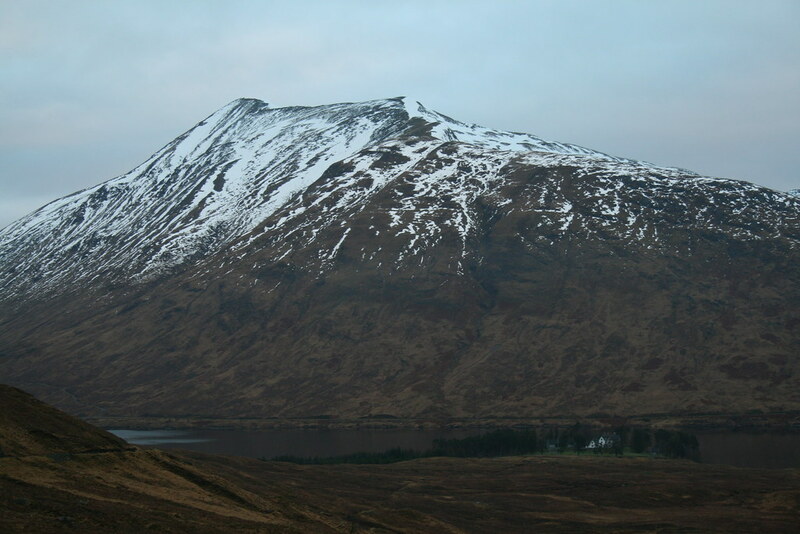 I looked back to the Lodge and the now clear A’Chralaig. The road continued on its gentle rise for another kilometre towards its turn to the east at a bridge over Allt Giubais. 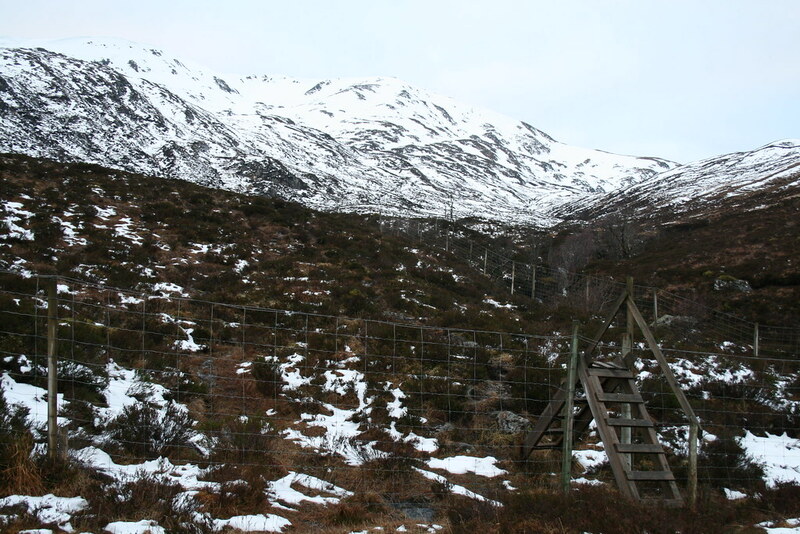 There is a stile over the fence here which gives access to the more direct approach up Creag a’Mhaim from the north. 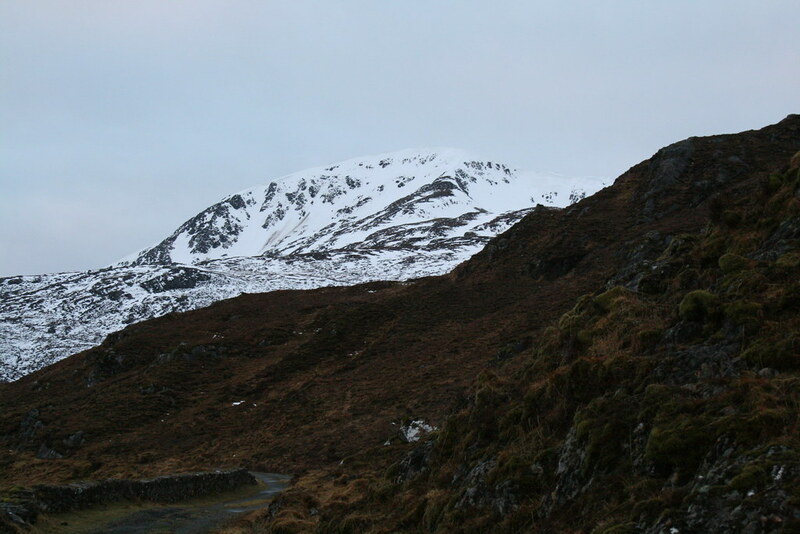 I considered going that way over the stile but didn’t like the look of the copious snow that would undoubtedly be soft and the cop out of continuing along the track to aim for the stalker’s path up the south east ridge of Creag a’Mhaim was more attractive. 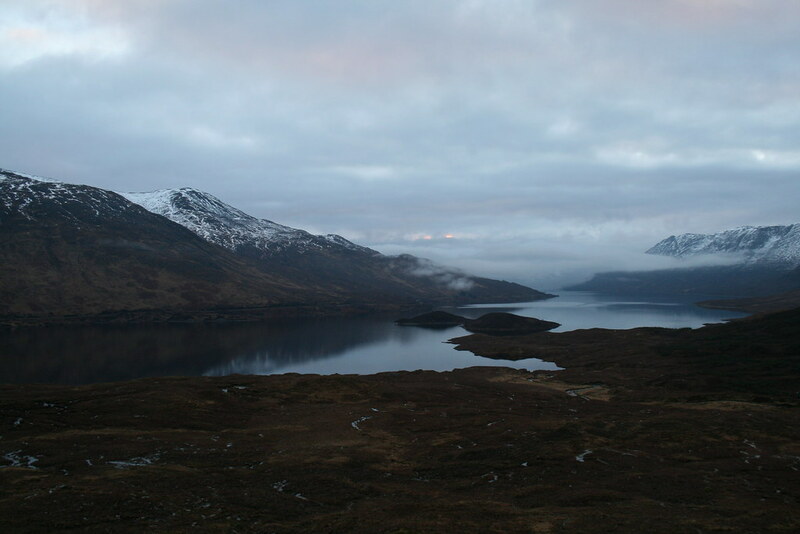 The cloud came down again as I walked over the pass that drops down to Loch Loyne. It was eerily calm and damp. At this point I had only gained 120m of elevation in 5km of distance. A third of that height gain is lost as you descend the final 1km to the stalker’s path. The beginning of the path was easy to spot. The snow was deep and even but certainly not crisp. Lack of hill fitness told as I struggled upwards. 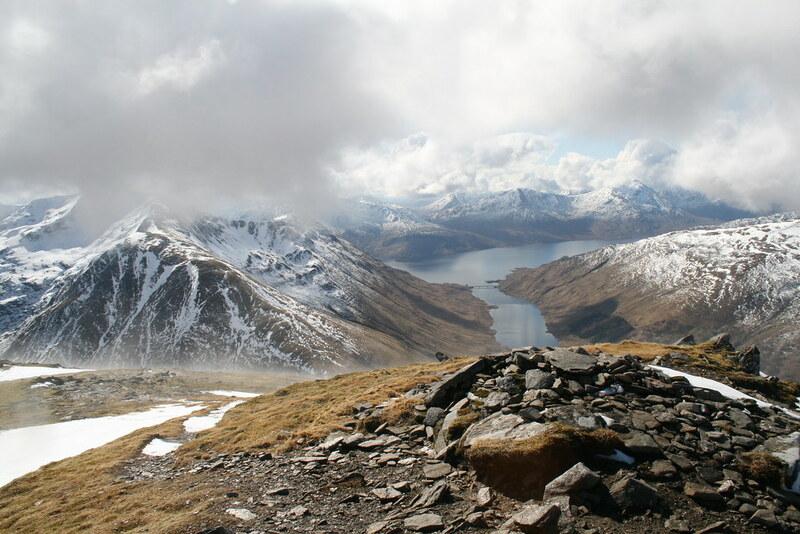 I was debating with myself as to whether I might in fact just do the first two Munros. 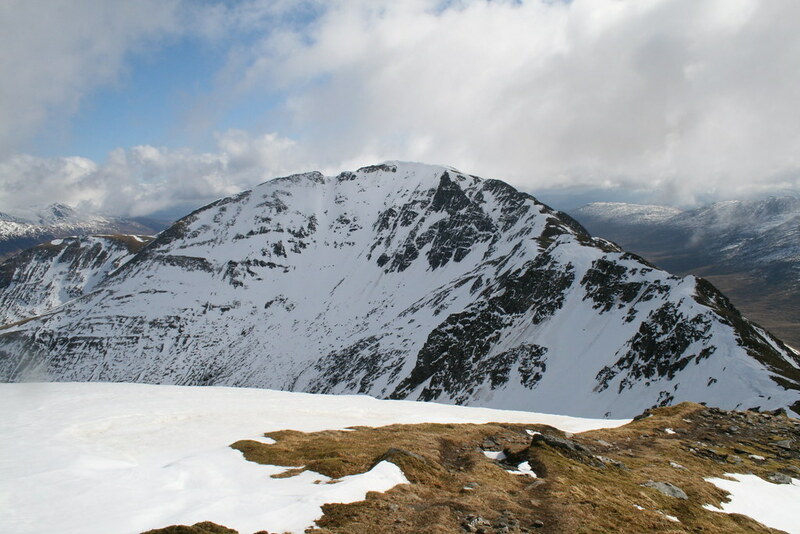 Bizarrely I had already repeated Aonach Air Chrith and Maol Chinn-dearg in the middle of the ridge and I reasoned that I could do the three at the far end of the ridge another day when the going was not so hard (or soft – you know what I mean). 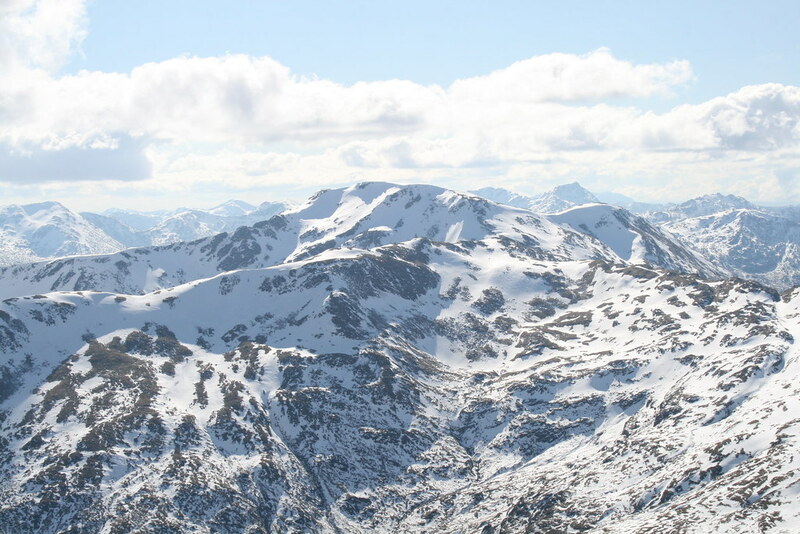 I decided that I would see how it went and what the snow conditions on the ridge itself were like. 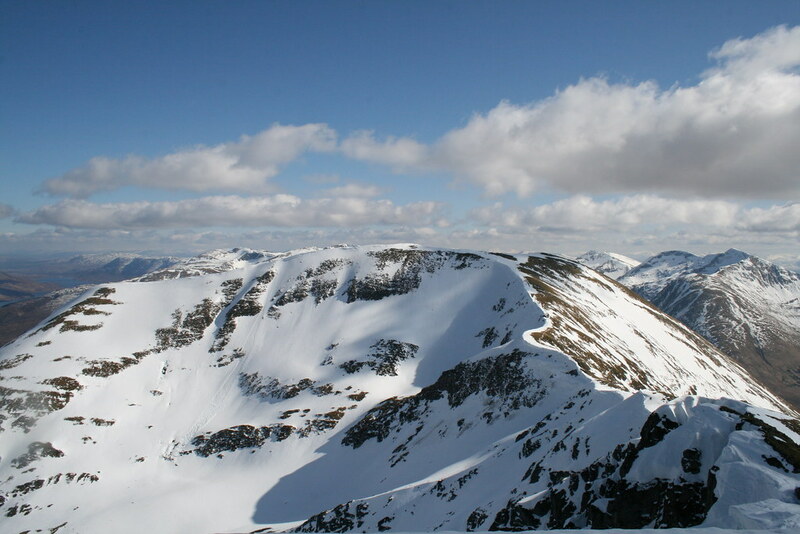 Fortunately the snow became much firmer over the final 100m or so of ascent and the contours eased. I looked down the way I had come. I enjoy looking back at my footprints in the snow especially when there are no others as was the case today. It gives a sense of satisfaction and of progress. A couple of hundred feet below I saw another person following. 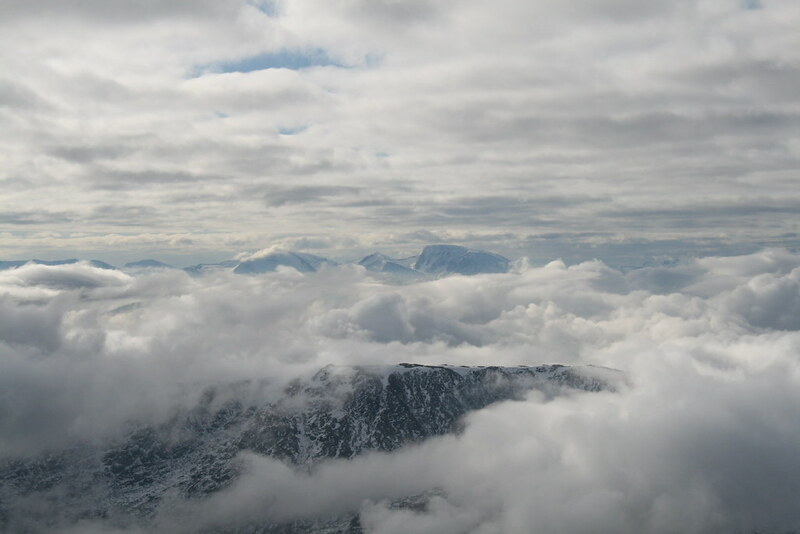 Ben Nevis loomed between two layers of cloud. 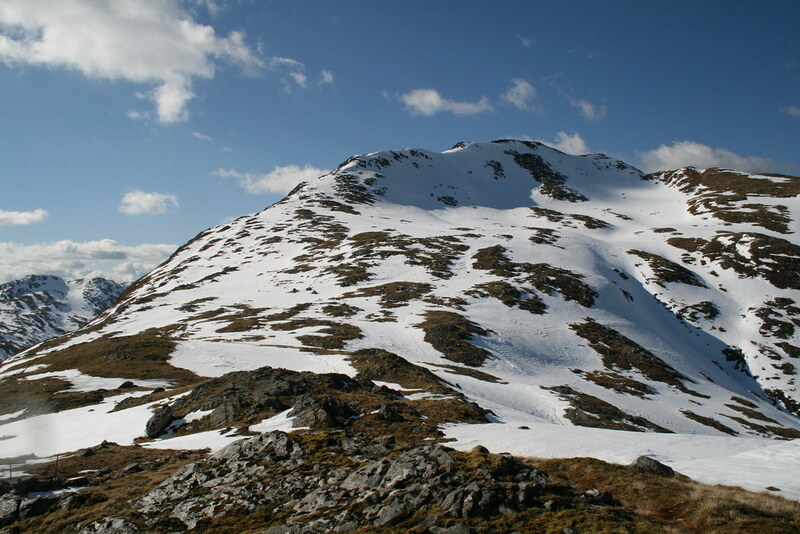 Creag a’Mhaim was reached at around 8.30am. Mmm, slowish progress. Still I was there and the weather was OK. With the gently wafting cloud to the west it was not possible to see what the way forward was like. I fired off a few shots north and east. I only had a brief stop before moving on to Druim Shionnach to see what lay in store on the ridge. 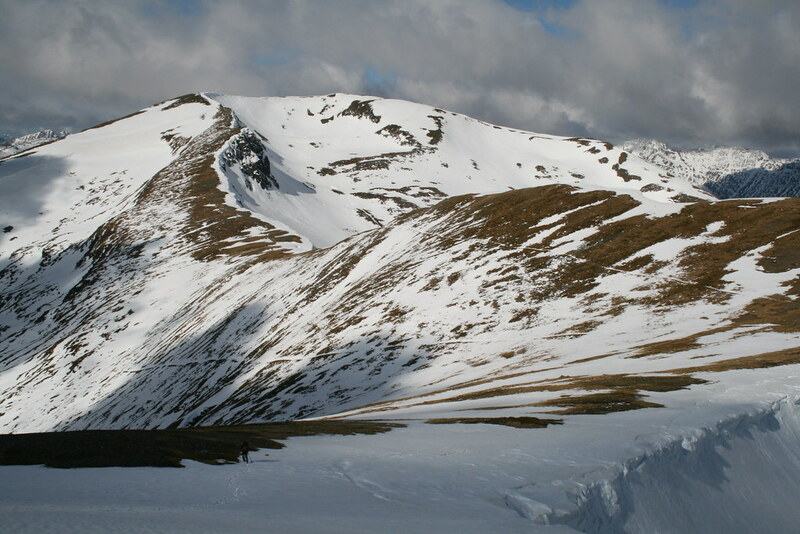 It is only an 80m drop to the col between the two Munros. 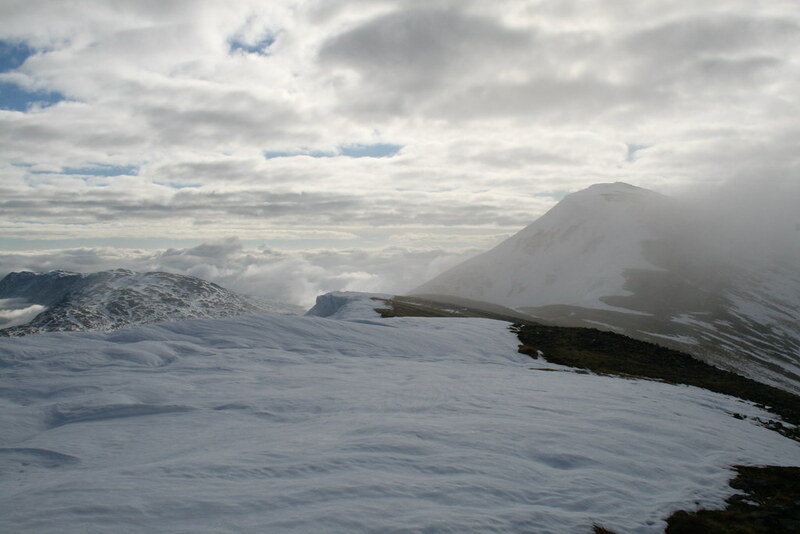 Shortly after starting the rise up towards the second Munro the clouds started to part. 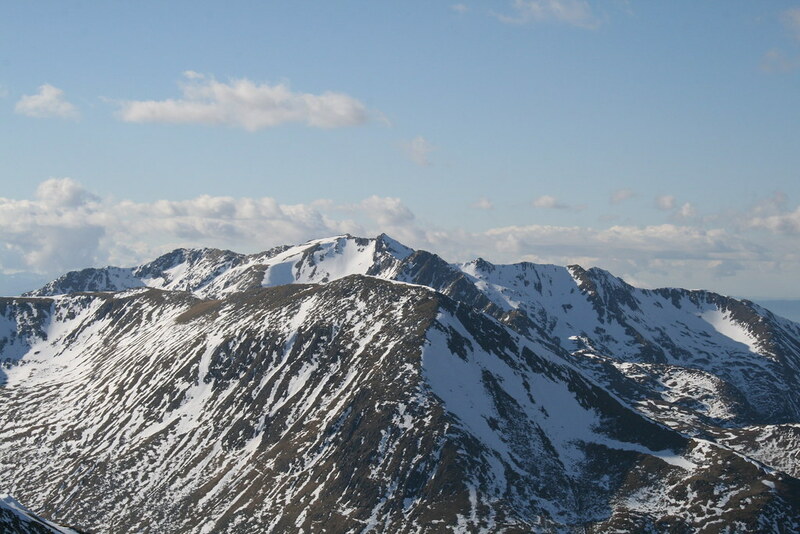 And I could also see that the ridge line largely clear of snow. Yay! 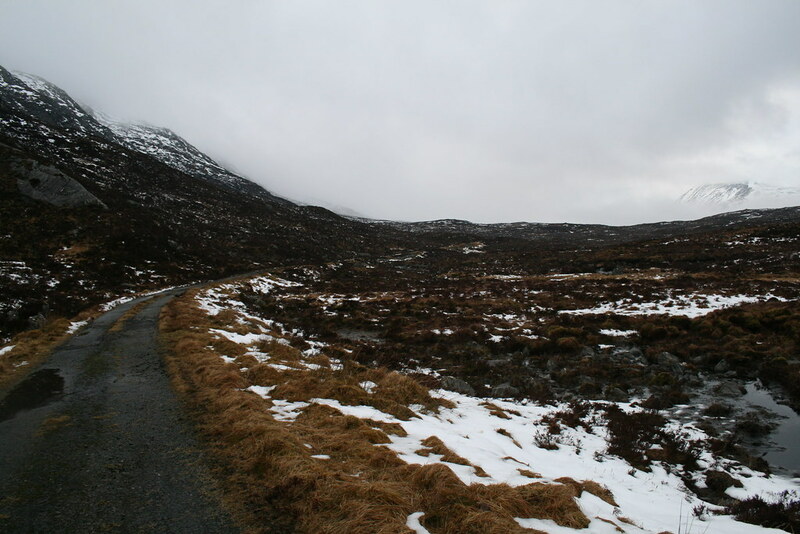 There is, however, a narrow section on the final climb to Druim Shionnach, this looked to be covered in snow. I approached this section with a slight degree of trepidation. 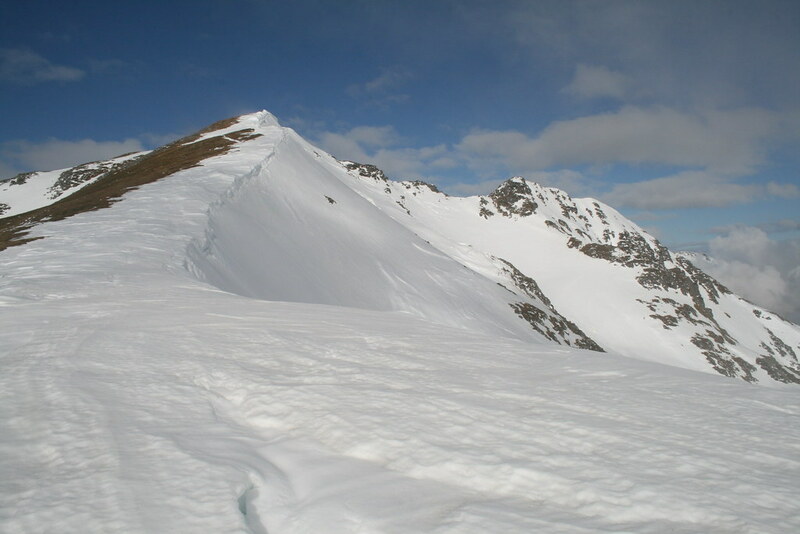 Snow had been blown by winds north and south into a narrow sinuous fin along the ridge line with a cornice on the northerly side of the ridge. But actually this turned out to be quite fun. Here the snow was the consistency of a slightly soft icing sugar. I was able to tip toe just to one side or the other of the top of the fin with an occasional use of hands to navigate the occasional rocky outcrop. The fun was over all too soon. 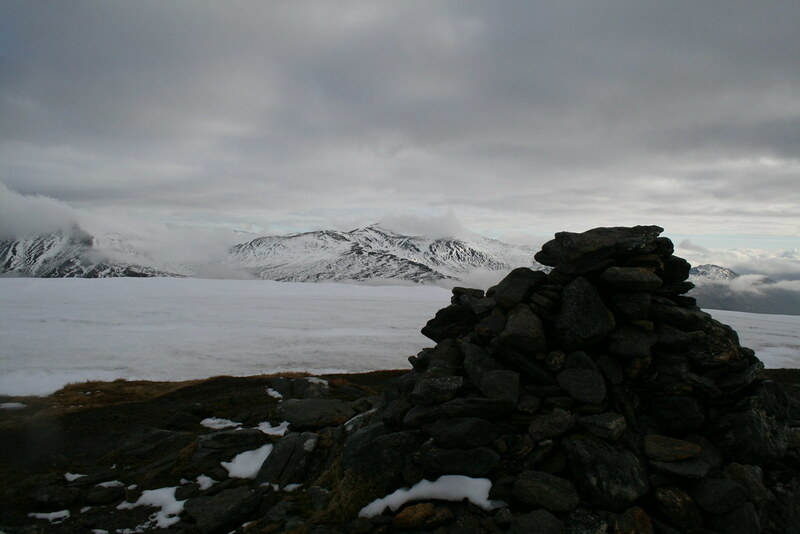 The summit was covered in snow and the cairn protruded just over the snow. 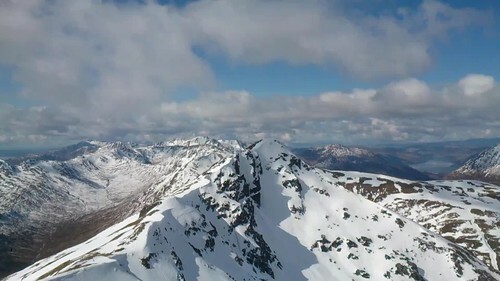 Despite the dancing along the final section of the rise it had taken just 35 minutes from Munro 1. I walked on 50 metres or so and found a rock just beyond to sit on where I could have something to eat and drink. 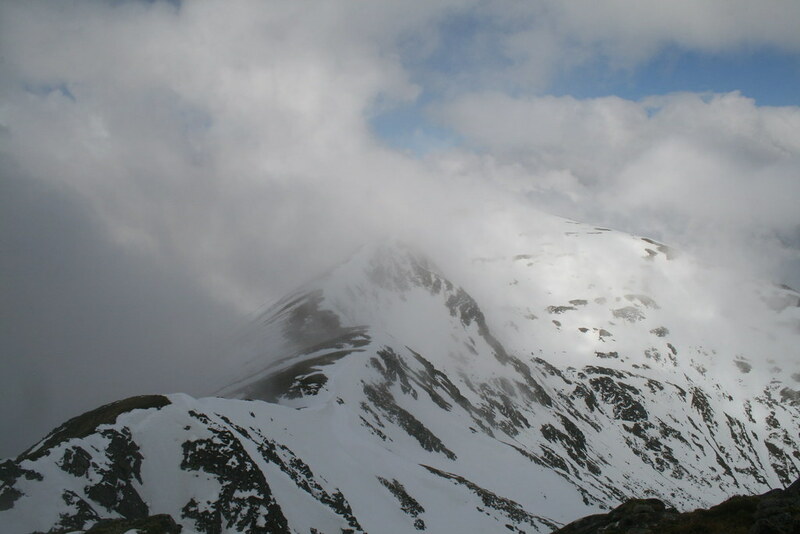 The top was swathed in blue/white vapours and gentle breaths of air. Looking directly up It was blue. But for the moment views in the horizontal plane were somewhat obscured. I anticipated the person trailing me would catch me up here whilst I was scoffing my second breakfast and he duly did. 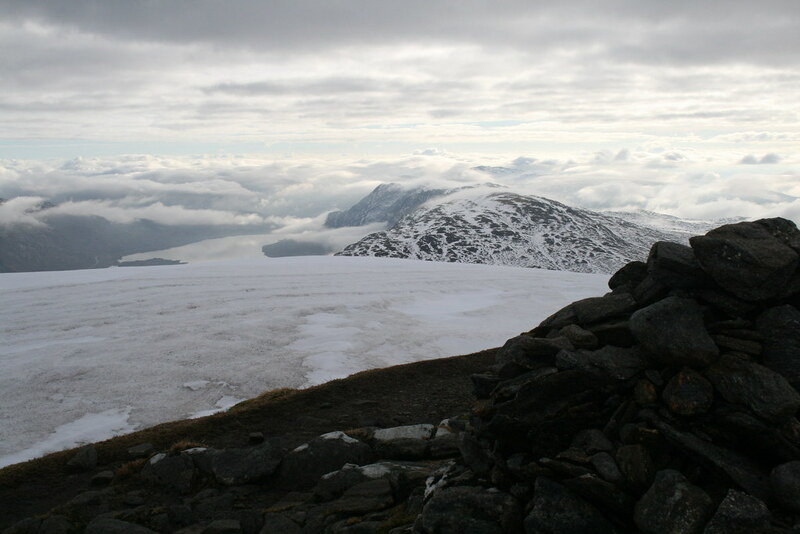 As we were chatting the cloud lifted – there was a fantastic view to the east of Creag a’Mhaim and an inversion behind. The weather was getting better and better, as forecast. We left together but soon each of us was stopping to take photos and so we kept overtaking each other whilst doing this. Ultimately I went ahead whilst Will took another set of photos. 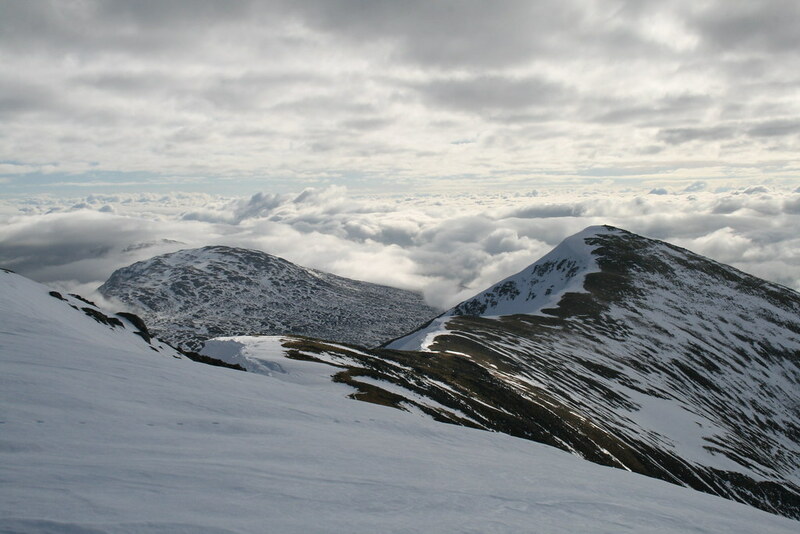 Aonach air Chrith is the highest point on the whole ridge and the cloud came down. Never mind, the weather was obviously improving. We did not stay long. 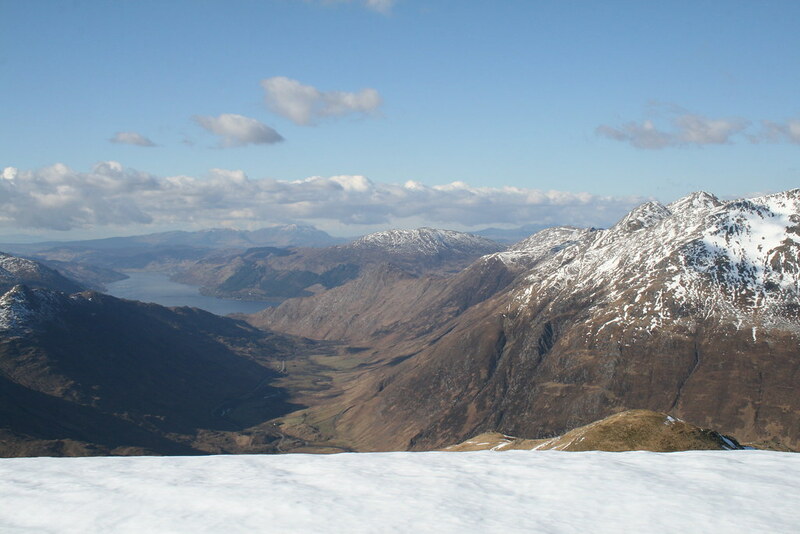 There was still a long way to go and Will was considering adding Sgurr na Sgine and The Saddle to the day’s outing. But we did not leave before sharing some trail mix to restore energy levels. 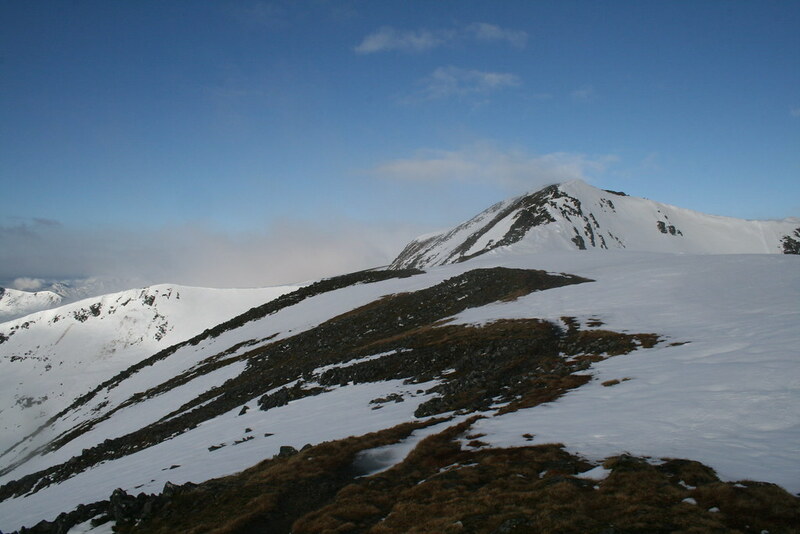 Just beyond the summit of Aonach air Chrith there is another narrower rocky section. Although this was largely snow covered it was OK. Just a bit of care was required. Again this section did not last that long. As that section was ending the cloud tore off the ridge ahead. By now the snow patches were becoming more extensive. Progress became a little slower. It took just under an hour from the previous summit. 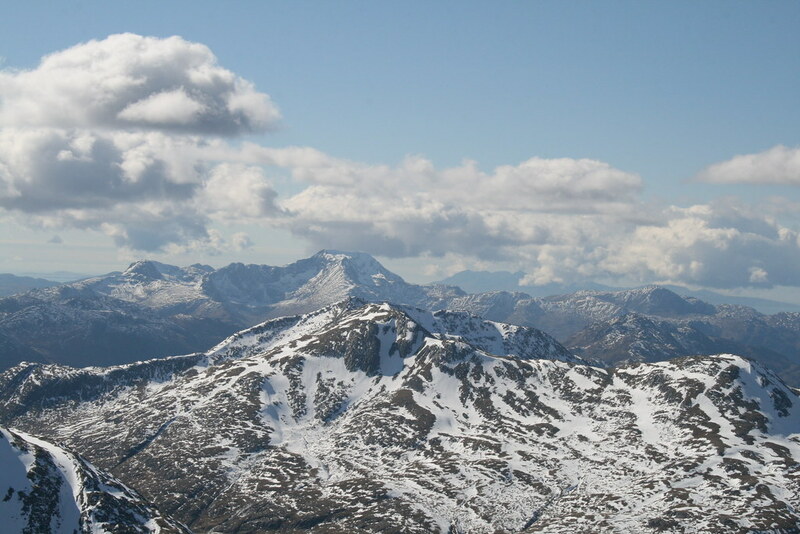 I was at my fourth Munro after less than 6 hours. The views continued to astound. After another quick bite we left after 15 minutes. With the broad ridge and more and more snow as we trended west, it was now fun running down the snow being careful to avoid the cornices. 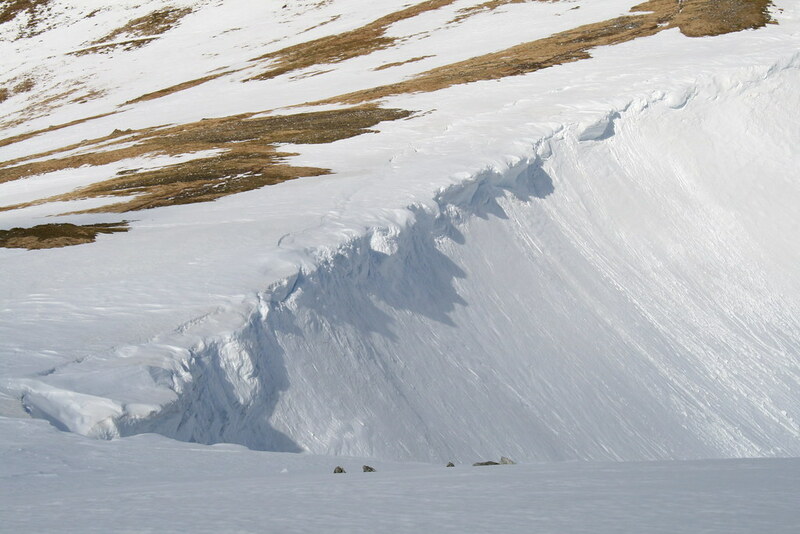 Most of the cornices had big cracks showing the likely break points. 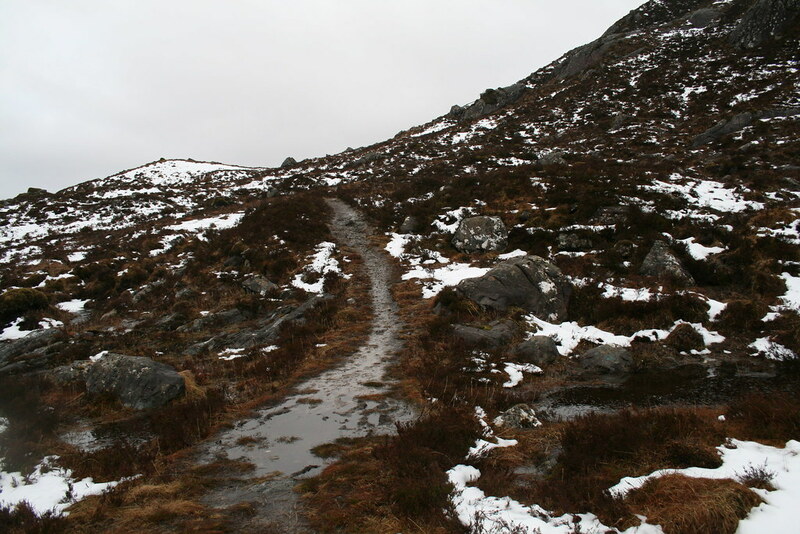 We took the cut across path below Sgurr Coire na Feinne. 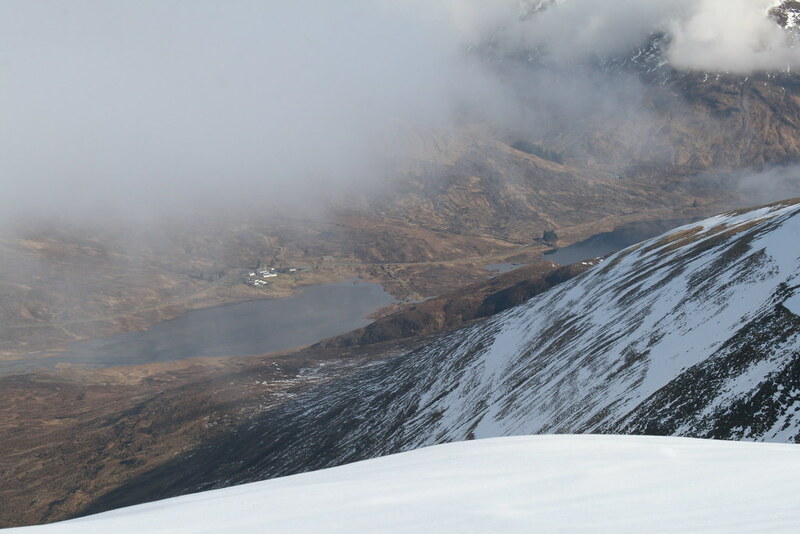 Will pulled ahead of me on the 190m climb to Sgurr an Doire Leathain. 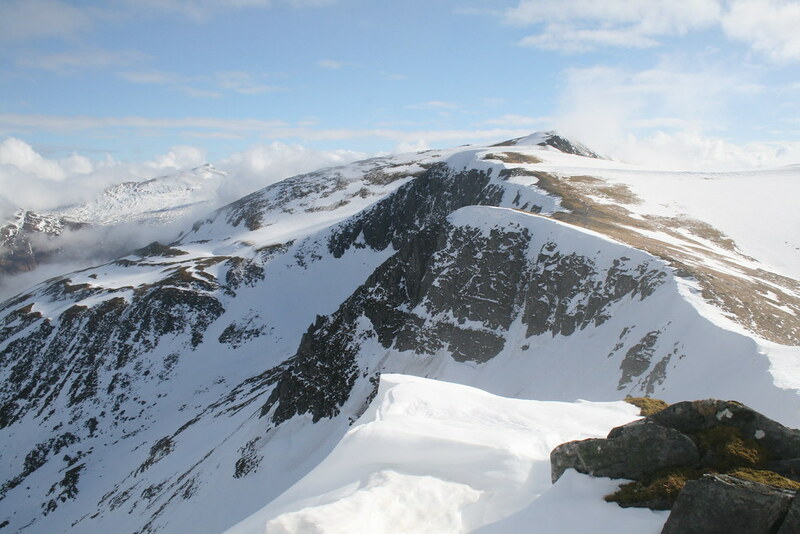 The WH route talks about being tired when reaching the final Munro on the ridge. 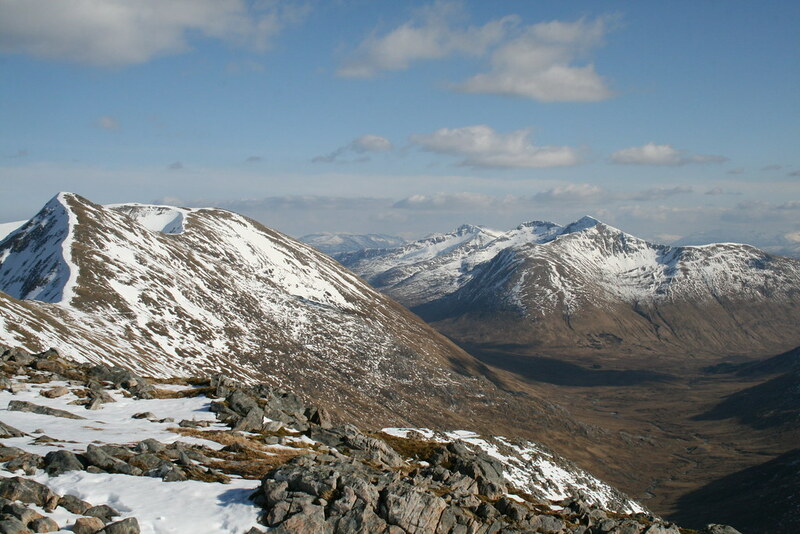 Well I can tell you now that by the time I was reaching the fifth one I was feeling a pooped – 50 minutes after leaving Maol Chinn-dearg. We reconvened as I arrived a few minutes after Will. 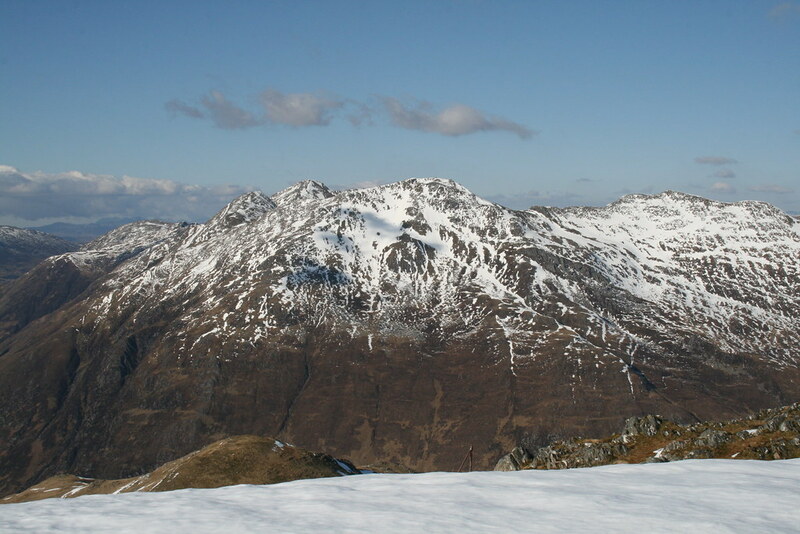 He was still considering continuing on to do Sgurr na Sgine and The Saddle. I said, being the old codger that I am, that I needed a bit of a rest to rehydrate and replenish my energy levels. So we said our farewells and he went off. I decided I would have a lengthy stop here. Although the air temperature was only a little above freezing it felt quite warm given the lack of wind and the solar radiation. 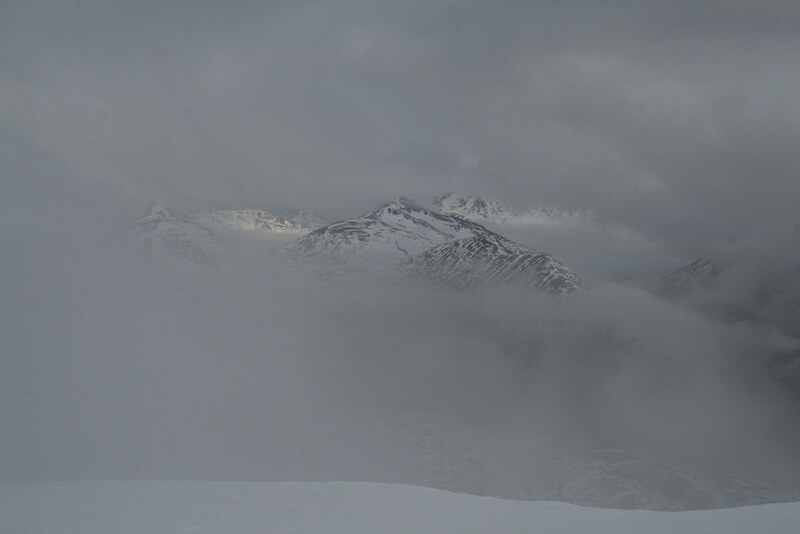 I called home to rave about the conditions and I downed ½ litre of fluid and ate. I watched Will as he descended to the col. 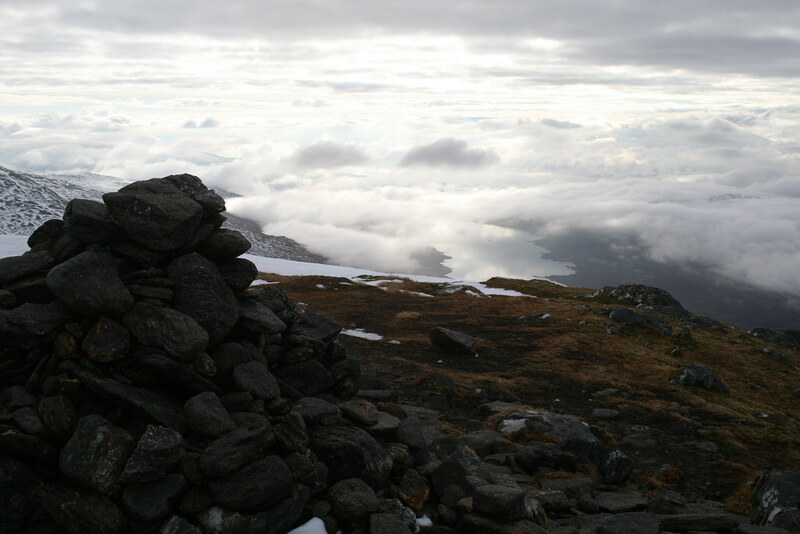 I could see the small figure of Will as he reached the summit of Sgurr an Lochain. I then left to follow. Again there was more snow to skip and glissade down. I was down at the col in 15 minutes. 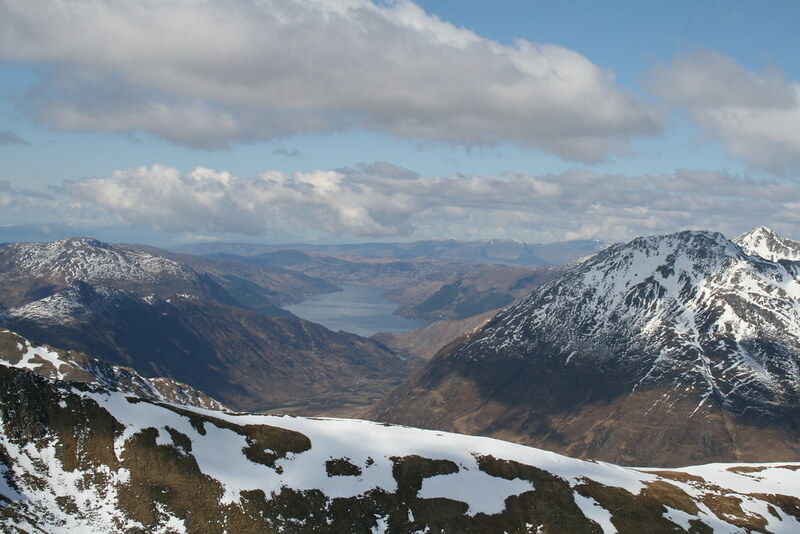 My extended rest had revitalised me and I steadily climbed the 120m making the top of Sgurr an Lochain 40 minutes after leaving the top of Sgurr an Doire Leathain. As the conditions were so good I decided to stay a while here too. Well why not! 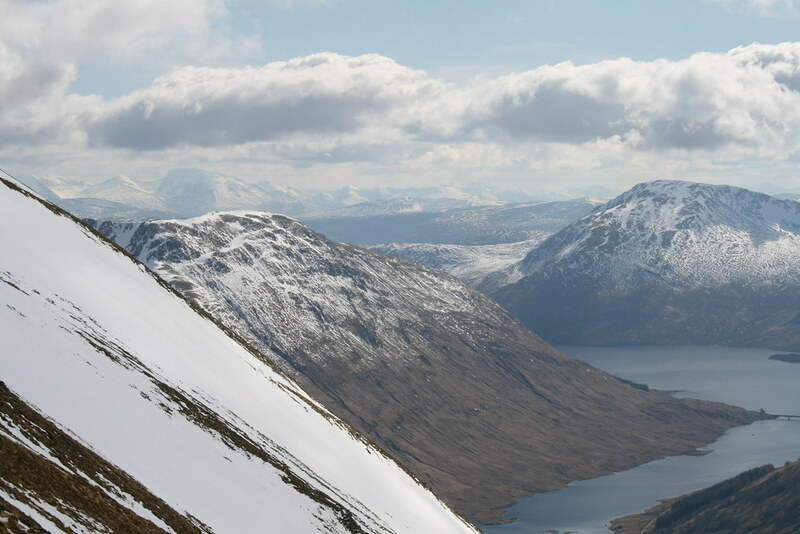 Once again I had a brilliant run down the slopes of Sgurr an Lochain. 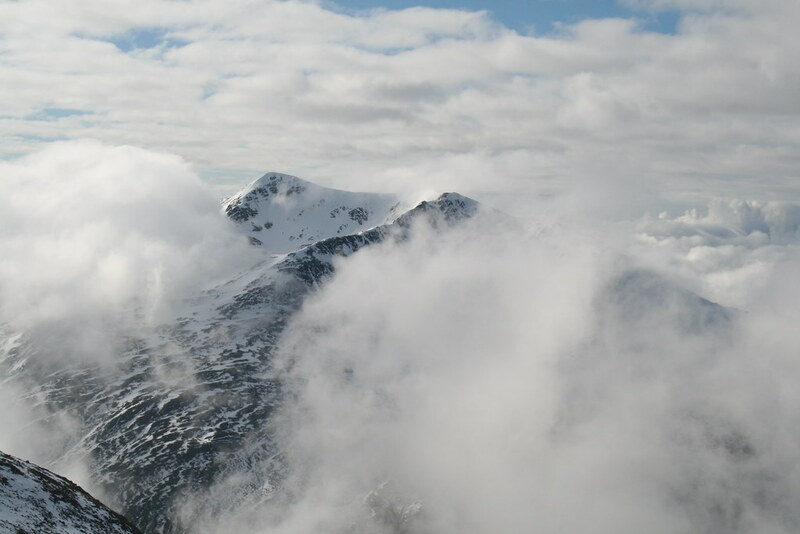 I was able to follow Will’s footsteps across the flank of Sgurr Beag. By now the footsteps in the snow formed little pools. My feet had been damp and now became warm and wet. 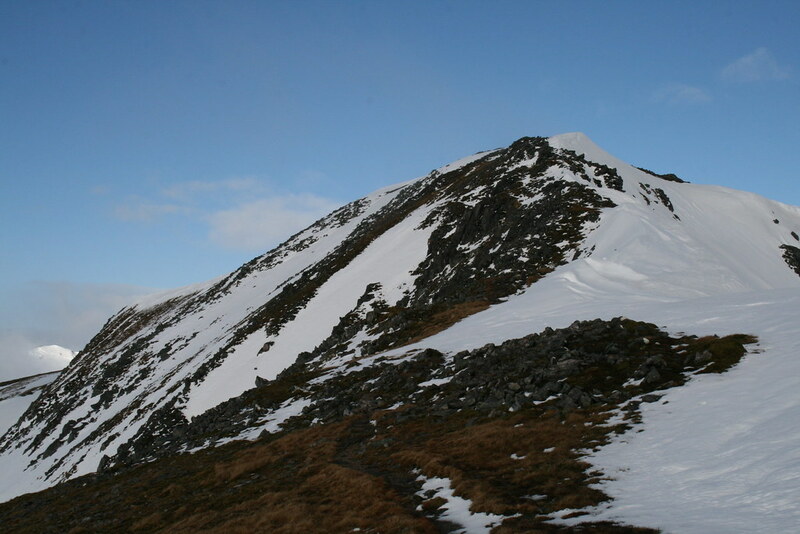 The col before Creag nan Daimh is the lowest col on the ridge. 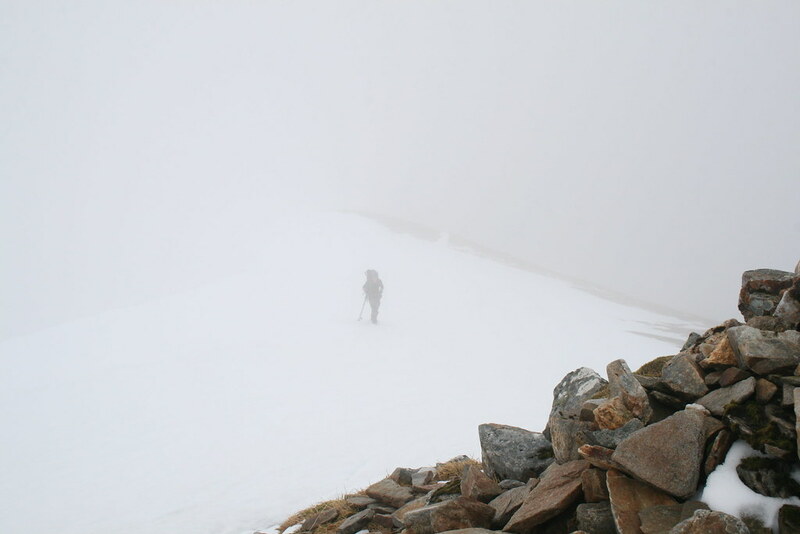 This was the most snowy peak of them all – the covering was now almost continuous = and whilst I was able to follow others’ footsteps they tended to give way. So they were of little assistance. 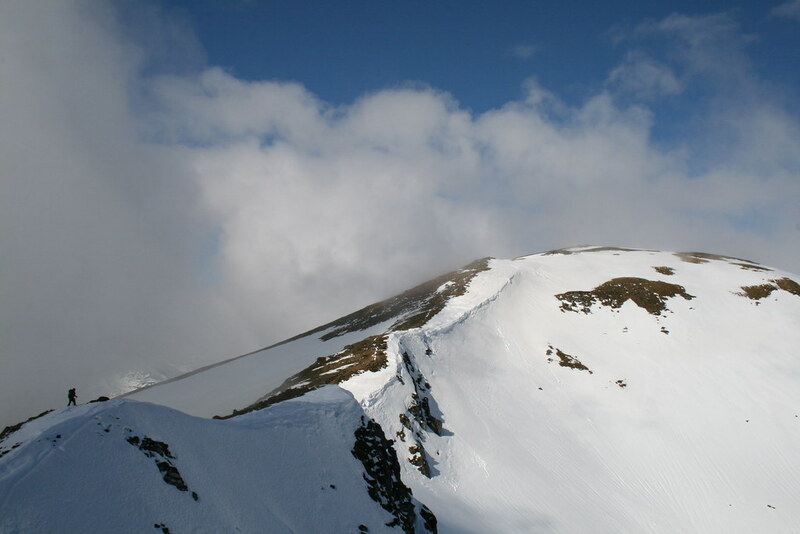 I happily reached the summit 1hr 15 minutes after leaving Sgurr an Lochain. 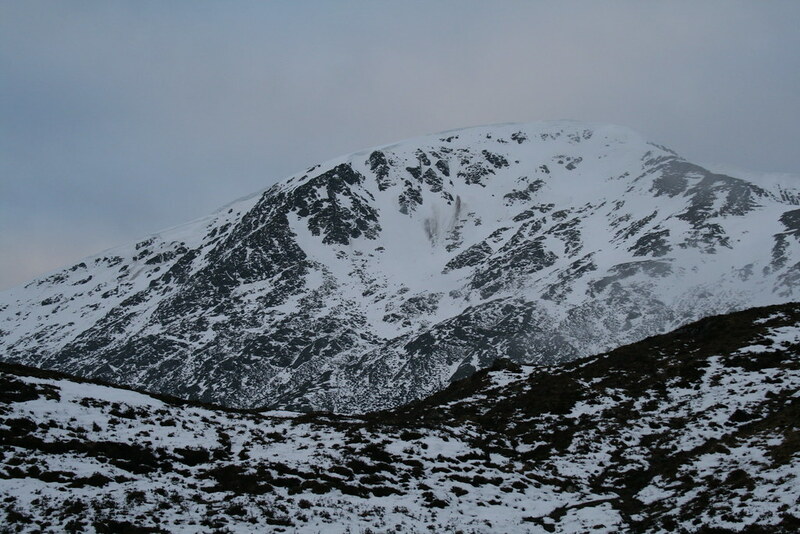 I didn’t fancy descending the west ridge with its steep scramble up a snow covered rocky bluff. 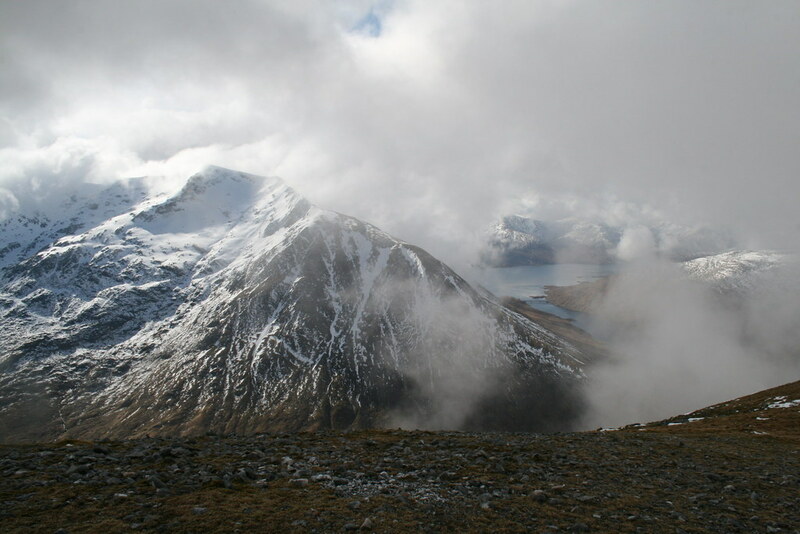 So I decided to descend the nw ridge towards Sgurr a’Chuilinn. This was steep at first, care being required on the slippy snow, but once below initial rocky section there was another less steep snow slope to run down. 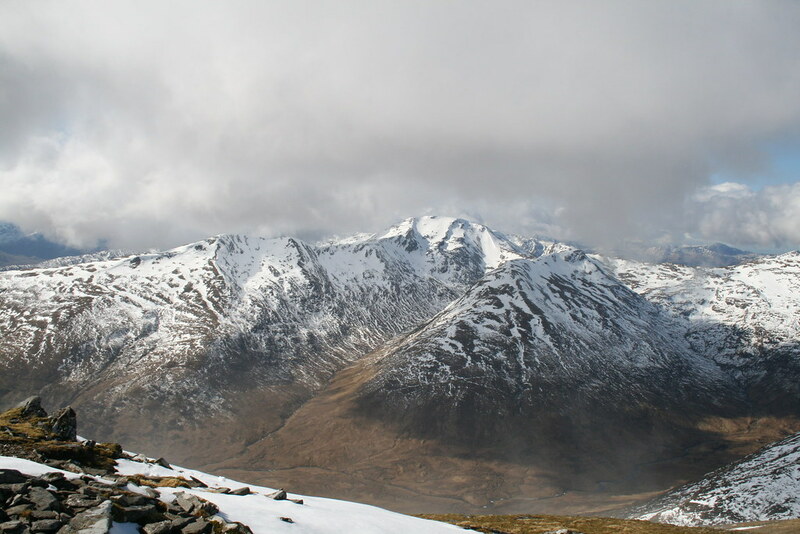 It was then up and over Sgurr a’Chuilinn. Whilst the ridge down towards Malagan Bridge was steep, the clifflets shown on the map were easily avoided. A dangerously rickety stile over the fence enclosing some young forestry and a tramp through the young trees followed. There was no stile on the other side of the enclosure but there was a big gate that was climbable and it was not far then to the A87. So the traverse took 11½ hours including stops of around 1hr 20 minutes.